The Township of Ewing’s Plan is an ambitious, market driven plan based heavily on strong urban design principles. Once site of the former General Motors and Naval Warfare Center, the L&G Team approach included Excel Environment (contamination analysis), URBAN Engineers (traffic anlaysis), and 4-Ward Planning (market analysis) to create a Plan that links existing neighborhoods and open spaces with development opportunities to create a fantastic new Town Center in the place of what once was the Region's job center. With I-95, the West Trenton Train Station - current serving Philadelphia and proposed to serve NYC, and the Trenton/Mercer Airport , the ability to recreate a strong market in Ewing Township is apparent and moving forward with numerous development proposals. ​Design was the primary concern in this plan and through the Local Redevelopment and Housing Law, the power to negotiate and implement this grand community vision derived through public input and significant regional expertise. 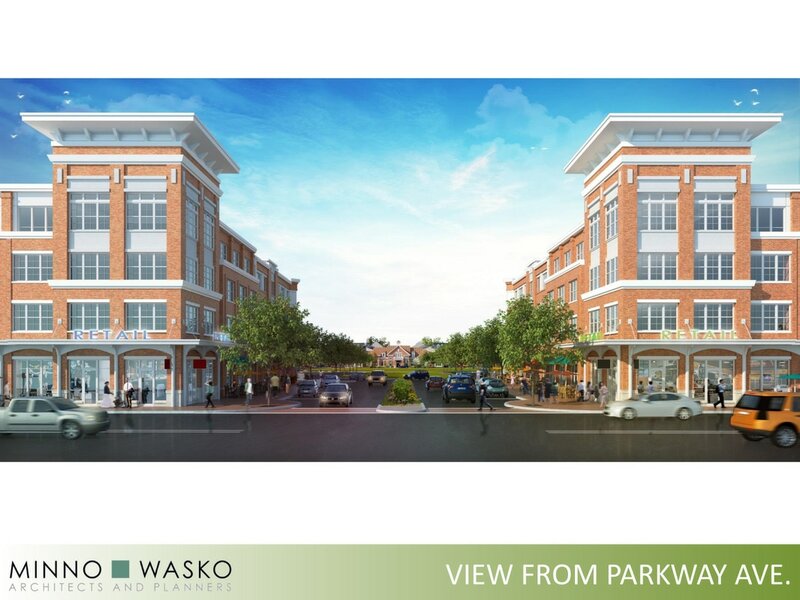 The Parkway Avenue Redevelopment Plan was introduced by Township Council on January 8th and adopted on the 29th by ordinance. This signified the complete public review as the new zoning ordinance governing the future of Ewing Township. The Plan presents a bold vision for the redevelopment of the former General Motors and Naval Warfare Center in Ewing Township. While the Plan is available for download, the General Motors site has been purchased and a development proposal by Atlantic Realty was approved by the Planning Board on September 14, 2016. The Presentation of the project can be found below.